I just spent several hours with my 3 wonderful sons in the kitchen bulk cooking and preparing Paleo meals in jars for this upcoming week. Not only are these convenient, tasty, and healthy, they’re just so darned pretty! Cooking and preparing food together is part of daily life in our family, and as far as I’m concerned nothing beats it for living the reality of real healthy food as connected to well-being and family life. •	Eating Paleo means lots of meat, veggies, fruits and nuts. •	I have kids going to day camp who need packed lunches every day. •	With the nice weather I don’t want to prepare every meal every day. •	Paleo-friendly convenience foods are limited, expensive and over-packaged. •	I can’t stand the tyranny of plastic containers (aarg where’s the lid?). But, best reason of all: my hubby and I are heading off for a mini-vacation to celebrate our 20th anniversary, leaving kids with childcare at home (woohoo!). A while ago, I came across this Big Red Kitchen Site with lots of recipes and ideas for Mason jar meals. That settled it. I decided that this was the time to make the transition to jars for leftovers, lunches, and bulk cooking, and rid ourselves of plastic hell. I bought several sizes of jars, adding to the ones I already had. It’s a good idea to buy extra lids from the get go. In my experience, sometimes the utility white plastic lids don’t seal tightly enough as compared with the two-piece canning lids. 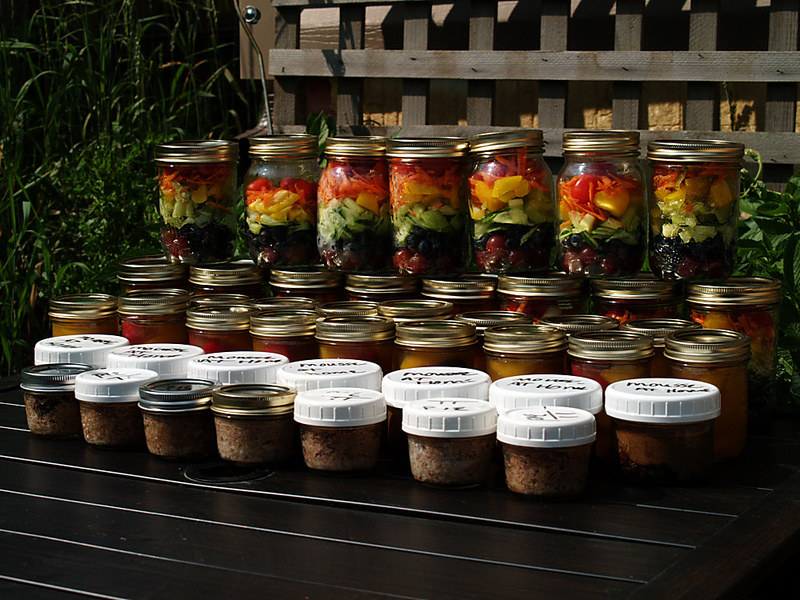 Some recipes were cooked in the jars; some are raw; some were put in jars after cooking, and some have a combination of each. 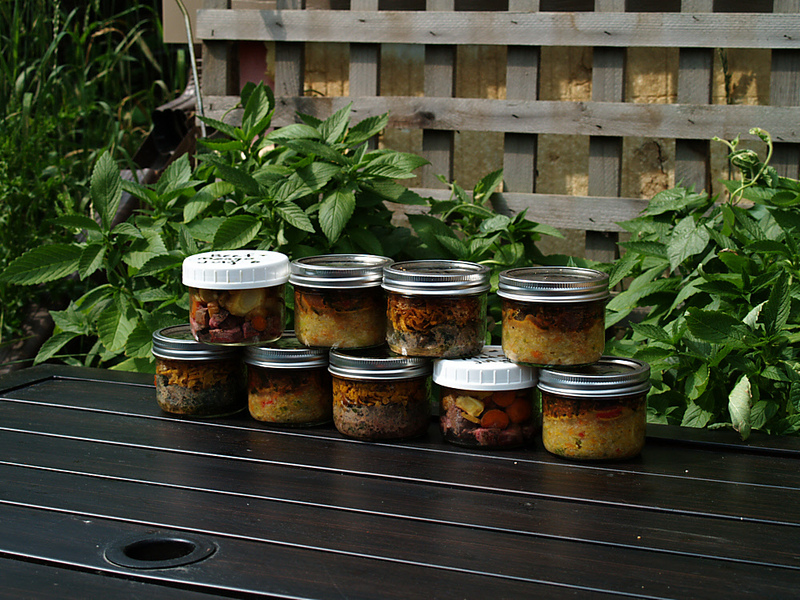 Please note that these meal-in-a-jars are not properly “canned”, and therefore have the same shelf life and refrigeration requirements as unjarred foods. The good news is that most of these recipes can also be frozen right in the jars. Shepherd’s Pie: Loaded raw and baked in the jar. Hamburger, onion, red pepper, spinach, garlic, salt and pepper. Press into bottom of the jar. Blend grated sweet potato with salt and curry powder and layer on hamburger. Top with ground almonds and a shake of paprika. Chili on Rice: Cauliflower rice: celery, carrot, red pepper, onion, salt, pepper, garlic, poultry seasoning, fried in olive oil. Add grated cauliflower and fry, then add stock (I used cooking water from sausage links). Chili: onion, peppers, spinach, hamburger, cumin, garlic, chili powder, liquid smoke, salt and pepper. Spoon rice on the bottom on the jar, and cover with chili. Beef and Mango: leftovers of beef strips, mango, roast carrots and turnips, and bok choi with garlic. Burger to Go: hamburger patty in a jar topped with tomato and homemade kechup, relish and pickles. Creamy Noodles with Chicken: Sweet potato noodles, garlic cashew cream sauce, with diced chicken. Assembled as dinner leftovers. Pigs in Blankets: cooked sausage, cut in slices but held together with a skewer (remove before adding lid), in the jar, surrounded by Paleo cake batter and baked in jar. Paleo cake: ground almonds and coconut, bananas, liquid egg whites, salt, cinnamon, fold in stiffly beaten egg whites. Spaghetti with Meatball: Assembled as dinner leftovers. Sweet potato noodles, tomato sauce with roasted red peppers, topped with a giant meatball: hamburger, carrots, egg whites, garlic, salt and pepper, baked on sheets. Cobb Pride Salads: cherry tomatoes, carrot, yellow pepper, celery, cucumber, blueberries, purple grapes. Fruit Jello: frozen fruit with jello made from unsweetened juice and gelatin. Apple Cream Pie: almond crust with coconut fat, salt and egg whites. Filling: diced apples, salt, cinnamon, ginger, coconut milk. Added to crusts which were pre-baked in the jars. Topped with raisins. Chocolate Mousse Pie: almond crust with coconut fat, salt, egg whites and cocoa, baked in jars, then cooled. Mousse: 5 avocadoes, 3 bananas, 1 can high fat coconut milk, melted chocolate chips, blended in the food processor. 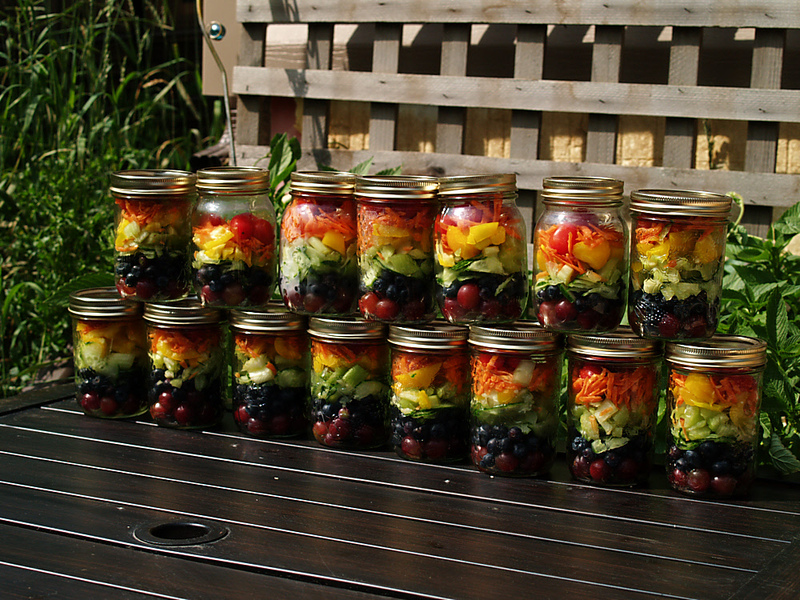 Each kid’s packed lunch consists of a main course, salad, fruit, and dessert, each in its own jar. Best of all, they can pack it themselves, and load empty jars into the dishwasher at the end of the day. Easy peasy, lemon squeezy! Thanks! 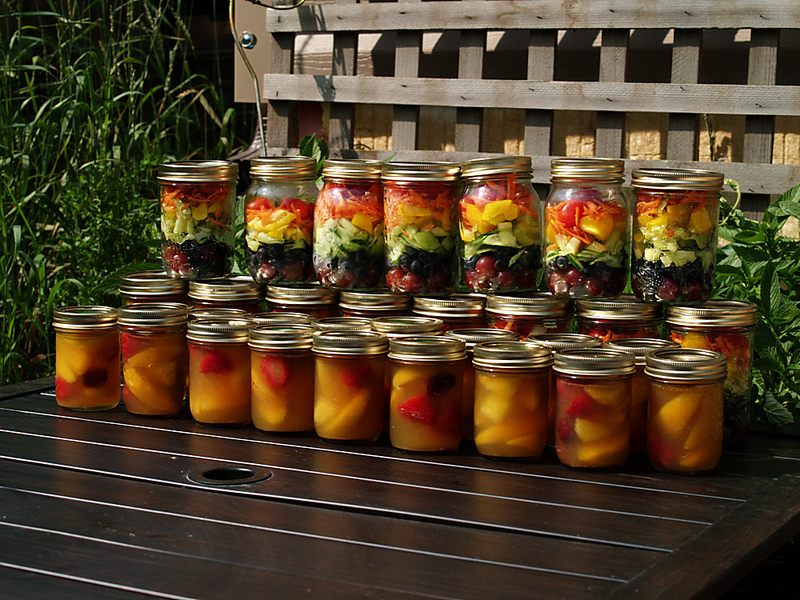 Yes, kids took 6 jars each to camp for lunch! Unbelievably great! Can you do coconut? If so, the pigs in blankets would probably work just fine with coconut flour.